Latest data compiled by the Central Statistical Bureau (CSB) show that in 2015 average monthly gross wages and salaries in the country reached EUR 818. 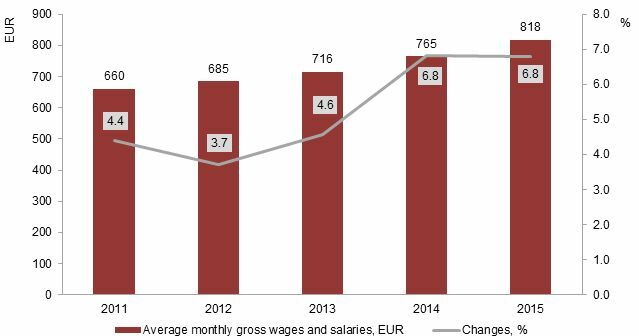 Average gross wages and salaries rose by 6.8% or by EUR 52, retaining the increase rate recorded in 2014. In 2015, average monthly net wages and salaries constituted EUR 603 or 73.7% of the gross wages and salaries; over the year the rise thereof was faster than increase of wages and salaries before taxes – of 7.6%. It may be explained by the reduction of Personal Income Tax from 24% to 23% on 1 January 2015. At the beginning of 2015, the national minimum wage changed as well – from EUR 320 to EUR 360 (increase of 12.5%), thus affecting the average wages and salaries. 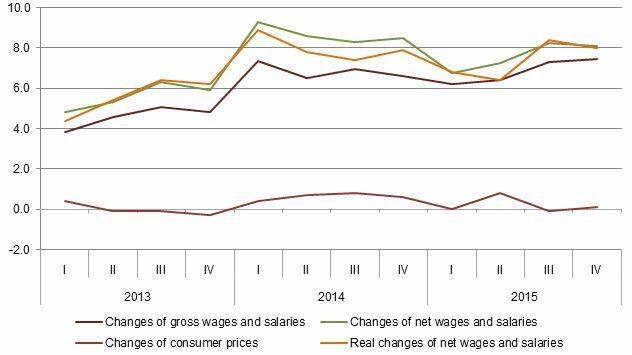 In 2015, the real net wages and salaries, considering consumer price increase of 0.2%, rose by 7.4%. In 2015, the average gross wages and salaries in private sector comprised EUR 799, in public sector – EUR 855, and in general government sector – EUR 797. In private sector wages and salaries rose more rapidly – by 7.9% annually, increase in public sector constituted 5.2%, and in general government sector – 6.2%. Compared to 2014, in 2015 average number of salaried workers in the country recalculated at full-time units grew by 1.0%, while gross wages fund rose by 7.9%. In 2015, the most rapid wage and salary increase was recorded in sectors with low labour remuneration: accommodation and food service activities – of 10.6%, real estate activities – of 9.9%, arts, entertainment and recreation – of 9.3%, trade – of 9.0%, and manufacturing – of 8.5%. Notable wage and salary rise was observed also in information and communication sector (of 7.8%); in 2015, average wages and salaries in this sector were the second highest in the country. Among the above activities, rise in wages and salaries in real estate and manufacturing sectors was influenced by the increase in wage and salary fund and drop in the number of full-time employees, while in other sectors increase was recorded in both – number of employees and wages and salaries. In 2015, number of salaried workers reduced in energy sector, water supply, sewerage, waste management and remediation activities, as well as in construction. 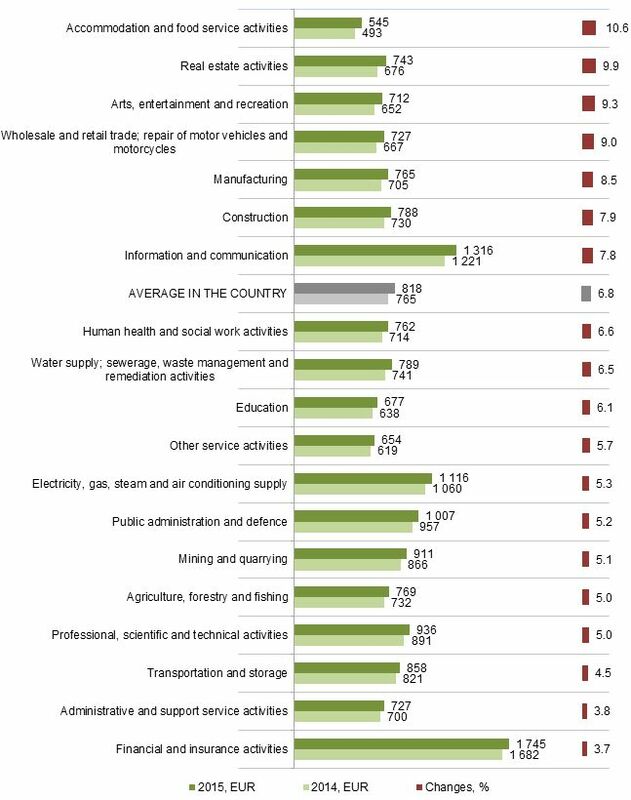 In 2015, the highest wages and salaries were observed in financial and insurance activities, information and communication, energy, public administration, as well as professional, scientific and technical activities. In the 4th quarter of 2015, average monthly gross wages and salaries in Latvia accounted for EUR 844, and during the year they have increased by 7.4%. Compared to other quarters of 2015, the 4th quarter indicates the most notable rise in irregular premiums and bonuses, while regular wages and salaries went up by 6.1% during the year. Compared to the 4th quarter of 2014, in the 4th quarter of 2015 wages and salaries in public sector grew by 4.5%, in general government sector – by 4.9%, and in private sector – by 9.2%. Compared to the 3th quarter of 2015, gross wages and salaries in the country increased by 1.8%. Wages and salaries in private sector rose by 1.7%, in public sector – by 1.9%, and in general government sector – by 0.2%. In the 4th quarter, net wages and salaries amounted to EUR 622 – an increase of 8.1%, compared to the 4th quarter of 2014. * Data on the 1st, 2nd, and 3rd quarter of 2015 have been revised. More information on wages and salaries in Latvia is available in the CSB database section Wages and Salaries – Key indicators. Data on wages and salaries in 2015 and 4th quarter of 2015 are published in database section Wages and salaries (Short term statistical data and Annual statistical data). Starting from 25 February 2016, the sequence of tables has been changed. Data source: sample survey of individual merchants, commercial companies, state and local government institutions, foundations, associations and funds as well as administrative data sources. In calculations of average wages in public sector the CSB includes central and local government institutions and their commercial companies, companies with central or local government capital participation 50% and over, except foundations, associations, funds, and their commercial companies. According to the European System of Accounts the general government sector includes central and local government institutions, the social security fund, enterprises controlled and financed by the central and local governments. Changes of the average monthly wages and salaries are calculated as not-rounded values, i.e., taking into account the value in cents. When calculating average monthly wages and salaries the number of salaried employees is re-calculated into full-time units, thus eliminating the differences in salaries paid for various workloads.